Somewhere in the green and pleasant countryside there’s a pond which is home to a flock of ducks, each with their own interesting personalities; one of these is the Scruffy Duck and this online slot carries his name – it’s developed by Net Entertainment and you can read all about it below. Scruffy Duck is a five reel slot with three rows and twenty five fixed paylines; the symbols on the reels spin against backdrop of the calm blue pond, dotted with lily pads and buzzed by the occasional insect. Four individual ducks represent the high value symbols – one with a mobile phone, one with a gift, one in a baseball cap and one with a lollipop; J, Q, K and A make up the lower values. 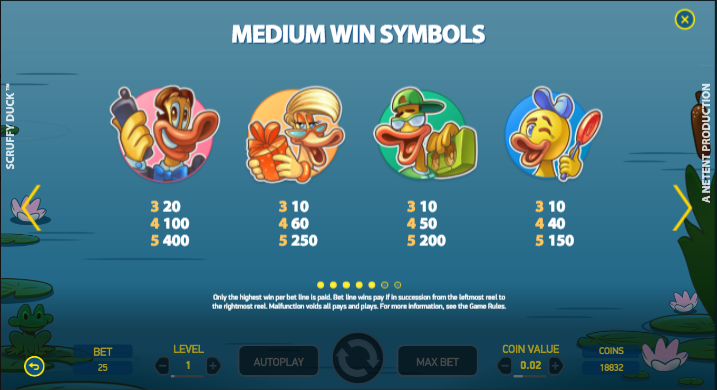 The wild symbol is a swan which can expand to fill all positions on it’s reel if a win is possible; it will replace all others in a winning combo except for the Free Spins icon. Multiplier – 15 free spins with a 3x multiplier for all wins. 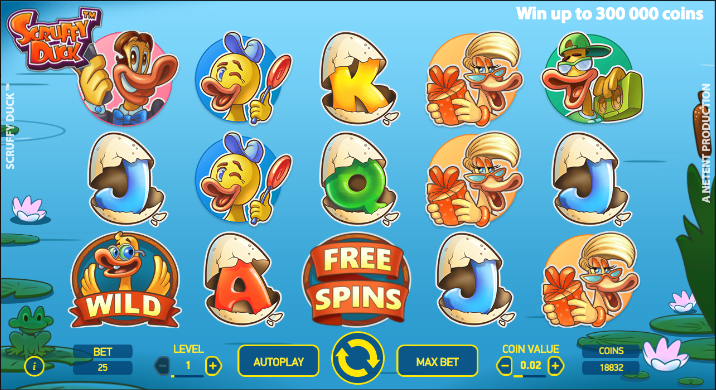 Symbol Removal – 12 free spins on a reel set which just has high value symbols. Colossal Wild – 10 free spins with the possibility of a 2×2 or 3×3 wild symbol appearing on reels two, three and four. Random Wilds – 8 free spins with between two and five wilds added to the reels when the spin has ended. Double Feature – 6 free spins with two of the above extra features active. It’s not possible to trigger any more spin from within this feature. Scruffy Duck is yet another enjoyable and high quality slot from Net Entertainment; it walks the line between complexity and simplicity very well and includes a well-designed bonus feature. The RTP is 96.38%.